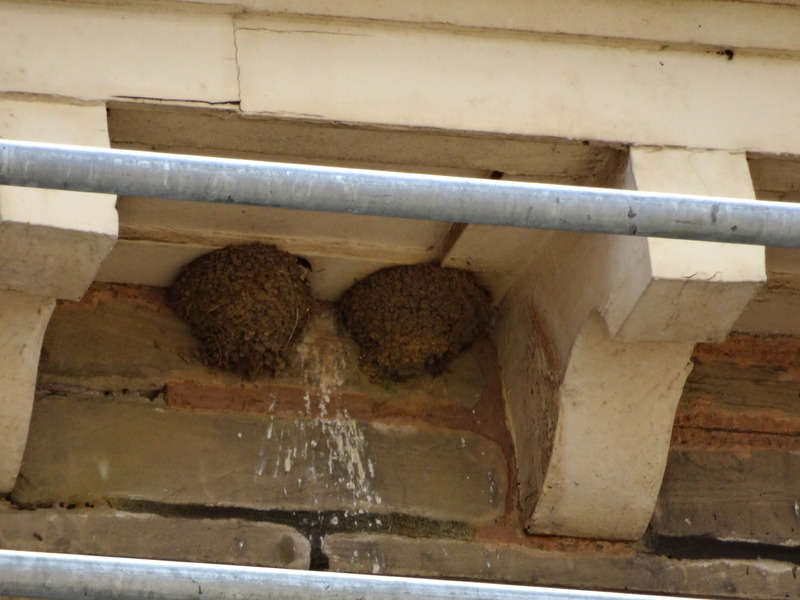 Debris netting has not been fitted near nests so the birds can still have access. Resident House Martin checking out the works from the comfort of the nest on the left. Young House Martin found outside the back door of Market Hall and rescued. 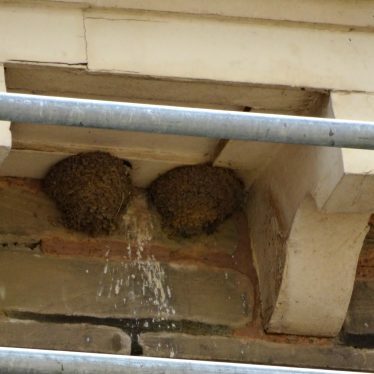 It’s not just curators that call Market Hall home, there are other non-humans to consider too. 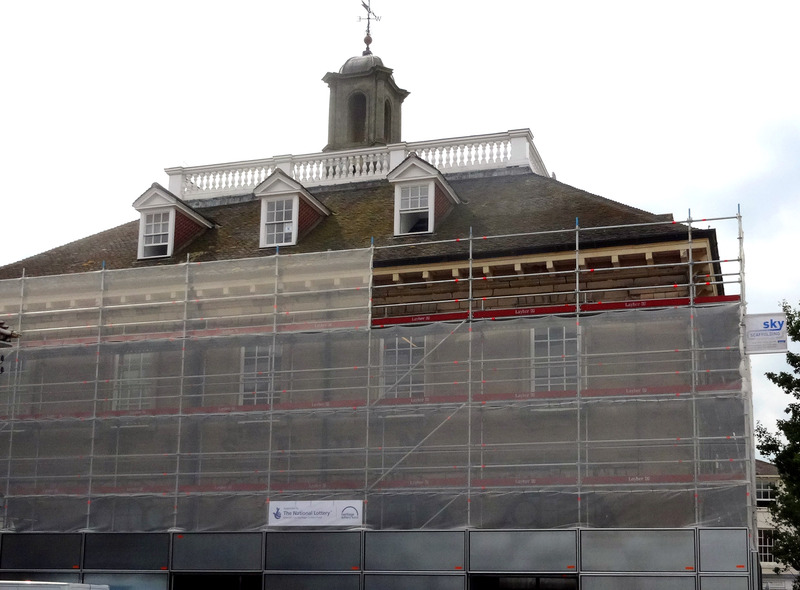 With that in mind, certain alterations had to be made to the scaffolding, which you can see from the pictures. 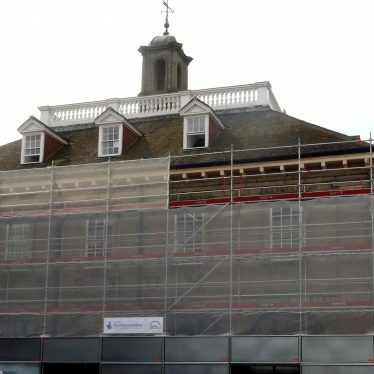 To allow the birds free access to their nests, debris netting has not been fitted in those areas and the stonemasons will not be working within five metres of the nests until the fledglings have flown. House Martins are not residents with us all year round, they spend the colder months in Africa and then migrate north for the summer (between April and October) where they build nests of mud in the eaves of buildings. They feed on flying insects, are found living in close association with people and tend to make their home near mixed agriculture, near water and in the vicinity of woodland. I have also shared a picture of a young House Martin we found outside the door of the Market Hall in 2015. It had crawled up into the corner, but as it wasn’t a very safe place so we took the little thing in to check it wasn’t injured. It was given water and seemed healthy enough, although maybe a little stunned, so the fledgeling was placed in the windowsill of the top floor – not far from it’s original nest. 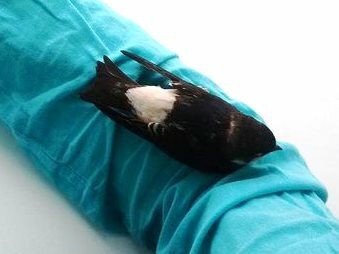 House Martin’s legs aren’t very strong so although they can take off from the ground, it’s quite difficult for them, especially if they aren’t feeling too good. Giving them a high platform to take off from helps give them an extra boost and they can swoop away. We left it to recover over the warm summer evening, and it wasn’t there when we came in the next morning.